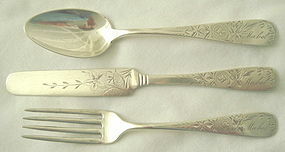 The Engraved Lily pattern was a somewhat standard bright-cut pattern – that is, it was made by several makers and was very popular ca. 1885. The lily blossoms follow the curvature of the handle, punctuated with diamond cuts. This youth set is marked with Sterling and the name of Harris & Schafer, a respected Washington DC retailer, which is unlikely to have been the maker. The set has been used but not abused. Wear is a very, very slight but even loss of crispness to the pattern, most likely from polish, and a slight shortening of the right outer tine. A hard oblique look indicates another tine has been straightened, but otherwise, there are no bends, deep scratching, or pitting. I'm probably making the set sound much worse than it actually is – it's actually quite nice and very presentable – but I do want to be forthright so as not to disappoint in any way. The weight is good at 90 grams. There is a frontal monogram, Mabel, in attractive script, and on the reverse is May 2, 1887 in the same script. The knife is 6.8 in., the fork is just over 6 in., and the spoon 6.15 in.